A town where stoplights hung as decoration with high hopes of serving a purpose, where the smell of peanuts traveled for miles during the summer, local restaurants were all family owned and your waitress had your order memorized and your drinks ready before you found your seat, everyone everywhere was on a first name basis and rest assured if they didn’t know you directly they knew someone that did. 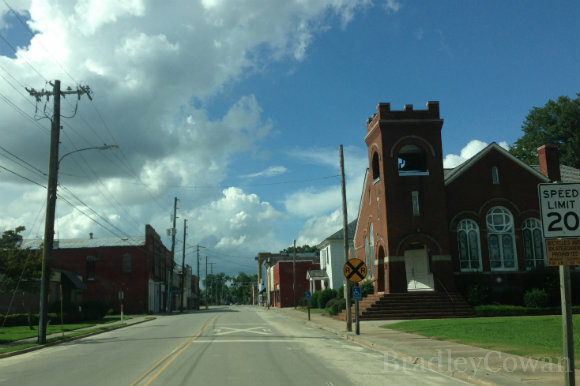 A town with a church on every block with a designated pew for families in each, where the participants in the Christmas parade outnumbered the audience, fields of cotton and tobacco served as your neighbors and several streets lacked the painted clothing of highways. I learned to ride my bike in that town and felt the sting of tiny leaves from a holly bush down the road. I practiced my trumpet before dinner and received feedback in the form of phone calls from neighbors around the corner. I caught lightning bugs in mason jars and splashed in mud puddles during downpours against my mother’s wishes. I played hide and seek in the woods behind the house and raced the neighborhood kids when the chimes of the ice cream truck were heard nearby. I cursed and cried my way through puberty, as any child does, hidden within the walls of my bedroom. I found the love of my life in the halls of the local high school and threatened curfew on more than one occasion. I will be forever grateful to that small town because of those things plus many more, however, I eventually outgrew those city limits and decided to leave with both Allison and the memories in tow… past the idle tractors at the town’s edge and into the sunset while hand surfing through the wind in my sails. Sometimes, now with Madison more than ever, I find myself thinking back to those days of my youth where time seemed to stand still like the smell of rain after a spring thunderstorm and afternoons were filled with neighborhood exploration sans parents. Regardless of where life leads, that small town will always have a part of my heart... it will always be home. Home will always be home, no matter where it is. Totally understand what you mean when you say that you think about the small town life when you think about your daughter. I think of "simpler times" too when it comes to our son. Yes! It's such a different time now (I used to roll my eyes when my parents would say that)... sad, but true.